When you are looking for a top tree care service in Mason, Warren, or Hamilton county look no further than Grace Tree. As a business with decades of experience in the industry, we place the client first in every job. Our mission is to make each and every client our top priority. We provide full-service tree care for both residential and commercial properties. Our clients have spoken, and we are proud to be locally recognized across the Internet with many 5-star reviews. ​We are pleased to introduce you to Grace Tree Service Mason. We are Warren and Hamilton County's most trusted tree care company! We offer a complete spectrum of tree services that property owners rely on. We have a commitment to client service and years of tree care experience, which makes us the go-to tree care company in the market. Whether you need tree removal, tree trimming, stump grinding, and any other tree-related service, please call Grace Tree for a free, often same day, estimate. We are here to serve you and your trees with expert care. We are the one-stop shop for tree care service. All of our tree experts and arborists have been trained and possess decades of practical, hands-on experience in the field. Further, our teams are trained in the latest climbing and cuttings techniques so that we always practice safe tree care. Of course, we are fully licensed and insured for your protection. 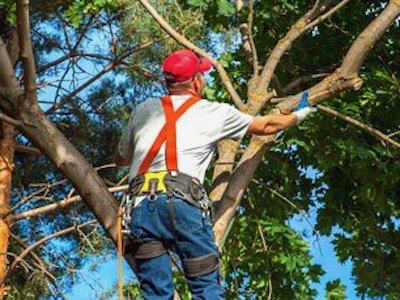 Without insurance (both worker's compensation and umbrella liability), a tree care company exposes their customers to both financial and legal risk. That is because if an accident would happen on your property, without the contact having insurance, the liability falls on the property owner. With Grace Tree, you can be assured we always practice safe tree care and are fully covered should the unthinkable happen. We operate our business with the best equipment in the industry. Tree care equipment is not inexpensive, however, we have made the capital investment purchasing new wood chippers, dump trucks, and stump grinders. We also maintain all our equipment to manufacturer's standards as well as operating them according to their guidance. One measure of a professional tree care company in Mason is the quality of their equipment. When you get an estimate from one of our competitors, ask them about their investment in the type of equipment necessary for quality tree work. We service both residential and commercial properties with the same level of customer service and quality tree care. So no matter if you just need a maple tree trimmed, or have multiple commercial properties where land needs to be cleared, Grace Tree have the experience, knowledge, and equipment to get the job done right. We always offer fast, free, and written estimates detailing both jobs as well as the pricing. While we may not be the cheapest tree company in Mason, we do offer the best value, when factoring in quality and affordability. 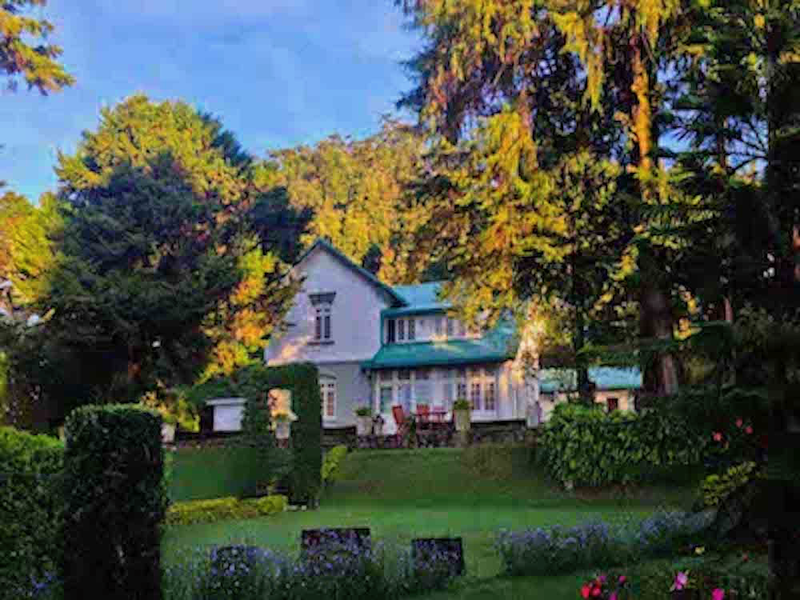 There is any number of reasons a tree may need to be removed: it is dead or decaying; severely damaged by wind or ice; diseased; causing issues with a property structure, such as a roof or power lines; and, creating a landscape problem, such as not allowing grass to grow in a large area of the lawn. No matter what the reason, we can safely and efficiently remove any size tree in any location. 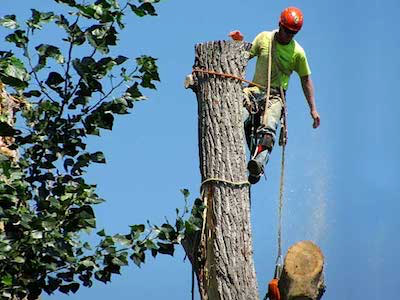 We have the experience, equipment, and skills to remove even the largest trees growing in the most difficult locations. Tree removal is often the only action property owners can take with certain trees are have become problematic. We treat each tree removal as a unique job. That is because each tree situation is different, in terms of location, species, lean, property structures nearby, etc. Therefore, we carefully plan the removal process so that it is efficient and safe. Tree removals also begin near the canopy of the tree where we begin cutting large limbs and safely lower them to the ground. On the ground, our team cuts each limb into manageable three-foot sections. We can either dispose of the wood for you or stack it somewhere on your property for use as firewood or some other purpose. After all the main limbs have been removed, we will be left with just the trunk. We will cut the trunk down to a level suitable for stump grinding, or if you don't want the stump ground, we can cut it at any height you want. Our ground crew will rake and pick-up all tree debris created during the process so that the area around the removed tree is clean when we are finished. Hire a professional the next time you need a tree removed - the risk of using an unlicensed and uninsured tree company is too great. This is a critical tree care service for many property owners. Trimming your trees should be done for several reasons. Trimming eliminates dead branches and limbs that both make a tree unsightly but also could be dangerous should they fall. Another reason to routinely trim a tree to encourage healthy growth. Specific limbs can be cut while other preserved to focus growth where it will be best and the strongest. Also, trimming trees is necessary to keep them away from property structures such as building, homes, and power lines. Lastly, trimming a tree helps preserve its natural shape and prevents it from overgrowing. Tree trimming is necessary for landscape trees. In natural settings, such as in forests, trees have to compete for sunlight so focus most of their growth upward. Conversely, landscape trees don't generally have to compete with other trees for resources, especially sunlight, so they can grow in every direction. This unrestrained growth can cause many problems that trimming will solve. Most property owners should have their trees trimmed every 3-5 years to avoid overgrowth problems. Pruning a tree is a less aggressive form of tree trimming. In tree trimming, major branches will be cut. While in pruning, you are removing smaller branches for health and growth reasons. Regular pruning can minimize, to some degree, the need to trim a three. Eventually, a tree will need a major trimming, but with years of regular pruning, this can be postponed. Tree trimming Mason trusts has been our motto since our inception. Pouring trimmed trees are a nightmare for the trees as well as the overall property aesthetics. Don't take a chance in hiring an inexperienced and unprofessional tree trimmer. Your tree might not survive the experience. Stump grinding is typically done after a medium to large tree removal is performed. Most property owners prefer not to have a decaying stump in the lawn and landscape. Tree stumps can and will attract pests and insects making them a potential hazard to have on your property, especially if near your house. Further, stumps will decay over time increasing their ugliness. We offer both stump removal and stump grinding services. Stump removal includes digging the stump and major roots complete out of the ground. This is necessary when the area will have some foundational work done so the ground needs to be free of any tree debris. Stump grinding, which is much cheaper than removes, involved the use of a stump grinder to essentially, grind the stump below the surface of the ground. Stump grinding is sufficient when all you want to do is re-seed or sod the area. 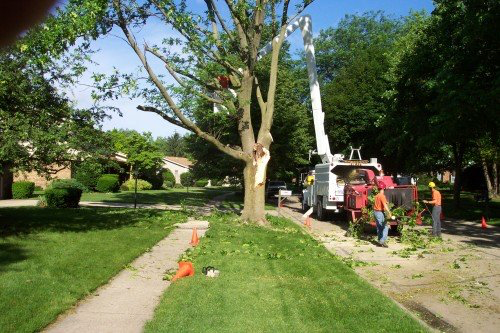 We offer 24x7 emergency service when you have storm-related tree damage. 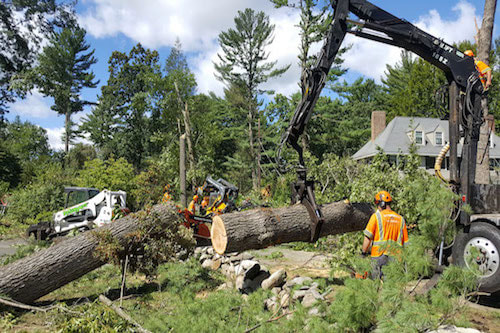 We know major tree damage can be stressful and you want to have it cleaned up immediately, especially if you have sustained some property damage and/or the tree is impairing the property's usage. Therefore, we provide quick responsive emergency service when you need us. We can be on your property within hours of calling us and have everything clean-up within 8 hours or less. We can remove downed and damaged trees, but we can also save some trees that were not too severely damaged. All the wood will be removed and tree debris chipped up. When we leave your property you will never know you sustained storm tree damage.